A separate issue first edition example of this wonderful coast survey. 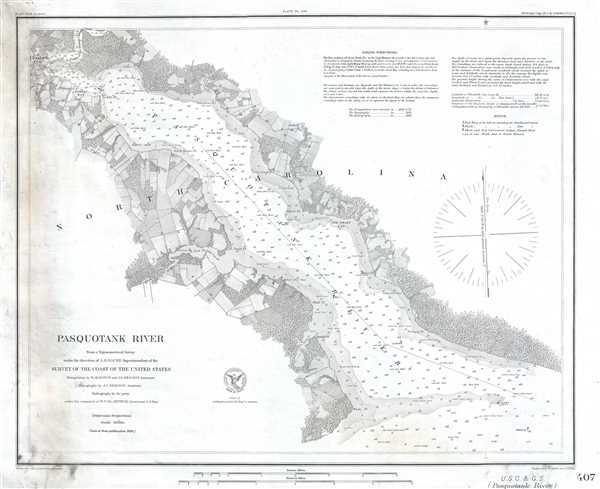 This is a rare separate issue first edition 1850 U.S. Coast Survey nautical chart or maritime map of the Pasquotank River in North Carolina. The map depicts the region from Elizabeth City along the course of the river to the river's mouth on the Atlantic coast of North Carolina. Highly detailed, myriad depth soundings, given in feet, are included all along the river, along with notes concerning the make-up of the river bottom. Numerous points and bays are also labeled and individual fields along the river banks are illustrated. Information concerning sailing directions, buoys, and other information important to the mariner are included in the upper right corner. Good. Backed on linen. Even overall toning. Soiling along left side.